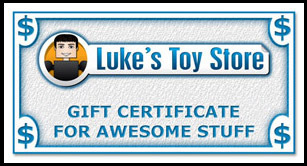 Give the gift of Minimates with a Luke's Toy Store Gift Certificate! We offer certificates in a variety of amounts, and the digital gift certificate code is automatically sent to the recipient that you specify. To redeem a gift certificate, simply enter the code in the Coupon Code box in the shopping cart or during checkout.